We have an extensive collection of gourmet ham and sausage online for those who want to break-out and move beyond bacon. Our breakfast sausages are available in links, patties or a smoked uncut raw roll packaged in burlap allowing the hickory smoke to gently and slowly flavor the sausage. Our gourmet ham selection includes center cut steaks, smoked bone in ham steaks and breakfast ham steaks. One of the smokehouses we use makes its home in Kentucky, where country hams became a part of life when early settlers brought techniques in preserving meat through winter. Dry cured and smoked hams are known for their rich color and mellow flavor, just salty enough but not overwhelming. Our extensive selection of bacon and dinner sausages include the Big Fork brand craft bacon sausages which are made with nitrate-free bacon and antibiotic-free pork with natural casings. Their meats are naturally smoked using real hardwood. You won’t find gluten, preservatives or artificial ingredients in these superior sausages. The sausages that we carry from the family owned Mountain products Smokehouse include gourmet chicken or pork sausages flavored with sun-dried tomato, spinach and garlic or simply garlic. Great for sandwiches as a side dish or delightful sautéed with your favorite pasta. 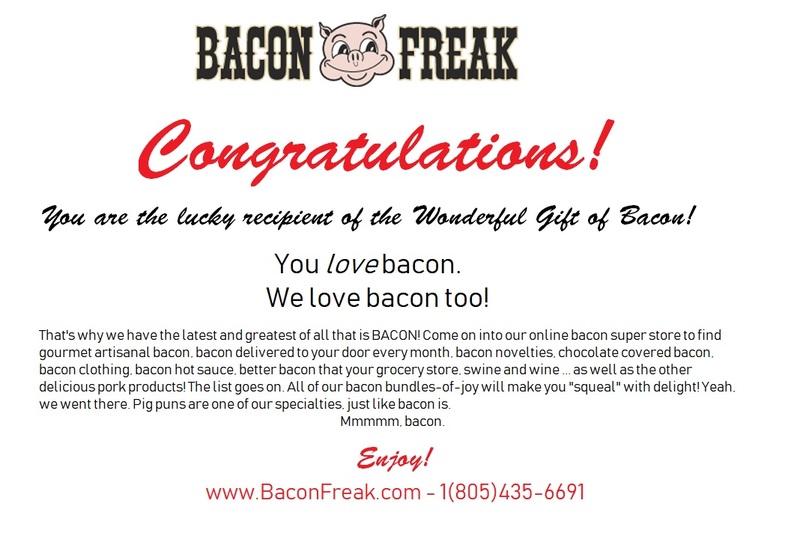 Bacon Freak carries gourmet ham and sausage online for quick and easy to-your-door delivery. Hickory smoked breakfast ham steaks are a great start for a stick to your ribs kind of breakfast. Cured smokey ham steaks sliced and ready for the skillet. Check out the recipe for red-eye gravy on the back of the package and see if you've got the stuff.